Yesterday the beautiful red head and I drove the bimmer up the bakery ride route. I wanted to show her the route and take her to eat a sticky bun. It was a beautiful ride, but we discovered that the Wildflour Bakery is closed on Mondays AND Tuesdays. We followed 176 to Hendersonville where we had lunch. Then we went back down 176 through Saluda on to Tryon. I had not been to this section between the two small towns. It was an incredible weaving downgrade. Next time I ride up there I'm not going to retrace my route back to Tigerville. I'm going to go on to Tryon. It will be a blast. We got back with plenty of light left. I decided to get in some miles. My mind was still thinking about our trip and how much fun it would be to ride that route on my bike. However, for some reason when I started riding, I had no desire. It wasn't really that cool so I wasn't uncomfortable. I just couldn't get in a rhythm and the route seemed monotonous. I just wasn't into it. Maybe I am mentally hitting the end of the season. Sure hope I'm more into it tomorrow evening. That will be the last Thursday night ride until next year. The bad news is that BBuck beat me yesterday. The good news is that it didn't matter. I could lose the next three races and I would still win the NASCAR fantasy league championship. There's more bad news. Jimmie Johnson won the Atlanta race. The good news is that Jeff Gordon is still holding the points lead if it is only by the slimmest of margins. It was a wacky race and I even found myself sorry for June Bug. If his engines aren't blowing up, his wheels are falling off - literally. His accident yesterday was pretty vicious! There are several places where you can start a favorite ride for Upstate cyclists. The Bakery Ride can start from Furman University, North Greenville University, or downtown Greenville. For this ride, we started at NGU. We arrived shortly after 8 AM. I noticed riders parking at NGU and near the Post Office. We parked our car with those by the old store. We unloaded and prepped our bikes for the ride. It would be a 35 mile ride there and back. The weather was great. I was concerned because I wasn't sure how to dress for the ride. I recalled my first ride to the bakery last fall. The weather was pretty cold and I was very uncomfortable. To prepare, I decided to wear a number of layers so that I could adjust as we went. Turns out we were pretty comfortable since it was about 56 degrees when we started our ride. By the time we reached Saluda the temperature had dropped into the lower 50s and the wind was blowing. However, when we finished the ride back down in Tigerville, the temperature had risen to the mid-sixties. A group of about 12 riders left just before us. We started out alone. Traffic was basically non-existent and we settled in to a nice easy pace talking as we rode. By the time we reached the water shed the sun was starting to filter through the trees. At one point I looked to the right and saw the sun coming over a ridge to my right while the nearly full moon, still clearly visible in the sky, was large above the ridge to my left. Scenes like these continued as we passed the North Saluda Reservoir. Several times we passed through canopies of trees with the sun filtering through the fall leaves. The wind would blow through the limbs above us causing the yellow, red, and gold leaves to fall in front of our path. Find more Bike Rides in Greenville, South Carolina I'm glad for today we started from Tigerville. I'm afraid had we started from Furman, I would have been a little more tired and might have missed much of the beauty around me. Next time, I'll start from Furman just for the experience. Looks like I'm going to be doing a different ride this Saturday. I had plans to participate in the Hour of Power, but then I got invited by some friends to head up with them to Saluda on the Bakery Ride. I haven't gone in a while and this is a fall time tradition, so I'm going to make the switch. I had it in my mind to do the Hour of Power so I could stop all this smack talking coming from Mike and Art. I guess I'll have to wait a week. Hopefully, we'll have some time to talk about it next Thursday night - I think we are still planning on giving it one more go before the time changes. The Bakery Ride is going to be fun as well. I'm riding with some guys I haven't ridden with in a while. I realized I haven't done that ride this year! I definitely need to get it done so I can add it to my GreenvilleOnline.com cycling blog. We'll be leaving from Furman. I've never started from there. The ride there and back will be over 60 miles. The weather is supposed to be sunny with highs in the 70s. Ahhhh, it is going to be great! It has been over a week since I "jammed" my fingers. However, I'm still feeling pain and sometimes it is pretty bad. It isn't that it has me rolling around the floor in pain, it is just a low, dull, annoying ache. It is primarily the middle finger on my right hand. Yesterday I went and had xrays taken. The technician said she thought she saw a fracture near the inside of the middle finger. "Of course," she hastened to add, "I'm just the technician. The doctor will let you know for sure tomorrow." So, I have a work-in appointment this morning. I'm not so sure that there is anything they can do about it. Still it will be nice to know for sure why I have the pain. I really, really think this will be the last Thursday night ride for Art, Mike, and me. Tonight it ended up being just Art and me. Mike got some kind of sinus issue and decided not to make the run with us. So, we have gone from about 8 to 10 guys on Thursdays down to just two. We met at 5:30 so we could get the ride in before it got dangerously dark. I hadn't been on the bike since Saturday and was still feeling a little banged up. However, I can almost make fists with my hands now and I had no trouble holding the bars. Shifting made me aware of the pain, but it was just annoying. Just as we started out, the rain began to fall. Thankfully, it was a relatively warm evening and the misty rain actually felt good. Not more than five minutes into the ride the rain stopped. We even saw the sun peek through the clouds at one point. We rode along talking about some books I was reading and other cycling type stuff. The we kind of separated for a little bit as we were going through some of the rolling and curvy sections of the ride. Then we reached Paris Mountain. "Well, are we going to give it the old college try?" I asked. Art responded that it would be nice to have a good tailwind so that we could get a really great time since Mike wasn't there. It would be fun to rub it in later. We hit the start at a good pace. We averaged about 11 mph until we reached that first straight climbing section. Once we worked through that, we were averaging just over 10 mph. Even though - or maybe because - I hadn't ridden since Saturday, I was feeling pretty spry. I'm still in love with my Tarmac. There is a definite difference in how I feel on the bike. With Art setting the pace, I had a very good feeling about tonight! Once we hit the halfway point, Art called out the time - 6:30. That meant we were on pace to have a 13 minute climb. Oh, that would be so nice! My best time up to this point has been 13' 16". Maybe this would be the night! Like I said, I was feeling really good - even at this point. I knew I typically gain time on the final half of the ride, so I stood and enjoyed the feel of the Tarmac's response. I was moving! About halfway up this section I started to realize that I had made a fatal error. When I was feeling good, I should have just sat back on Art's wheel and allowed him to pace me up. As it is, I had left him behind me during my burst, but here he came steadily moving ahead. I grabbed a hold of his wheel and tried to recover. We made it to the last marker - a caution sign saying to stay at 15 mph for the curve ahead - in 11' 18". That was probably the fastest I had ridden to that point. Unfortunately, any gains I had made were about to be negated. I stayed with Art until we reached "The Wall." He then stood and accelerated. I tried to match it, but just didn't have it. I blew up big time. I was pedaling like you see Frankenstein walk in the movies. One laborious clomp after another. Still, I tried to give my best. I crossed the line in 13' 22". That is only 6 seconds off of my best time. It was frustrating because I had not used my head. Art finished the climb just one second off of his best time at 12' 48". Had I not tried to take off back there at the halfway point, I would have approached that last climb much fresher and while Art still probably would have dropped me, I still would have had more in the tank to at least beat my best time. The ride back from there was pretty uneventful except as we came off the mountain the rain started up again. However, this time it wasn't just a mist. The drops were stinging. I rode the descent with one eye closed and the other one squinting to keep the rain from hitting my eyeballs. I know that next Thursday is definitely out for me. I have a prior commitment. I'll be surprised if Mike and Art do it alone, but I guess it is possible. I'm looking forward to Saturday morning. It felt so good to get back on the bike after so many days off. I'm keeping the typing to a minimum now days. However, my fingers are starting to feel better. The road rash is another matter! Monday and yesterday I also found that I might have suffered a mild case of whiplash. This morning that is feeling better but my neck still feels stiff. Man, I can't wait for all this to go away! Today will be a pressure filled day. Dr. Bob announced that he was endorsing Mitt Romney. I'm sure I'm going to be responding to all kinds of questions today. Hey, individuals have every right to speak out. However, people need to understand that folks at the school get behind various candidates. The institution - because it isn't a person - can't endorse anyone! It is up to each member of the University family to make their choice. Just because one person backs a particular candidate doesn't mean everyone else endorses that candidate as well. My run in with the official meant I got to the line later than I wanted and I didn't get on the front row like I wanted. While waiting to start the officials went around checking the numbers. I had made sure that my number was turned correctly and to the left of my back. However, as soon as I saw my official friend walking toward me I knew it wasn't going to be accepted. A nice guy behind me was kind enough to make the very minor adjustment. I tried to shake it off and get back the grin I had on my face the day before. I knew I had the potential do well, but I just needed to get going and move through the unknown. Then it was time to go. Things started off kind of fast. Since I was on the outside, there were a good number of riders that got out in front of me. For a moment, I had a fear that I was caught behind some slower riders and there was a gap forming. However, as we started onto Rhett, I caught some riders on the turn and as we crested the first hill I counted about eight riders ahead. For the next couple of laps, I stayed between the top 5 and 10 riders. I was feeling a little winded and my legs were hurting a bit. It was tough, but I knew it would pass and I would only feel better during the mid point of the race. On lap 4 - at least I think it was - I heard an awful sound right off my rear wheel. Someone went down and crashed into the metal barrier. This was in the Camperdown/Rhett corner. It was the most technical one. I had come close to the barrier once myself. That lap and the next, I started feeling much better. I even broke out of the line and made a move past a couple of riders on the Main Street stretch. At this point, I knew I was going to make it. So, I didn't push it and tried to stay in contact with the front so I could cover any move that might develop. Then it happened. I think it was lap 6, but they all seemed to run together. Up to this point, I had entered most corners with other riders. This made me adjust my lines at times or work to maintain a line so I wouldn't cause problems. On this entry into the Camperdown/Rhett corner I was on the wheel of the guy in front. No one was on either side of me and there was a slight gap to the guy behind. I decided to try to cut in on the turn to avoid getting too close to the barrier and also to get more speed going into the climb. I went to the edge of my tire and then went over it. My bike went down right beneath me. I slid stopping before reaching the barrier. As soon as I could get unclipped I got up and pointed my bike in the right direction and hopped back on. I did all of this and there was still parts of the field coming past. I figured if I could get back on, I might be able to use some riders from the back to work to the front. I started down Rhett toward Augusta and saw the leaders on the other side of the intersection. I knew it was going to be hard, but I didn't want to quit. I shifted to a harder gear and started after them. As I rolled I began to assess the damage. My bike appeared to be fine. Then I realized I really couldn't feel my left hand. Just as I reached Augusta, I looked at it. My pinkie finger was sticking out to the side at a nearly 90 degree angle. It took a second for it to register and my first thought was, "How will I be able to shift with my finger sticking out like that?" My second thought was that I had broken my finger and I probably needed medical attention. I stopped and asked the course marshal, "Can I get a medic?" He replied, "The medic tent is on the other side of the course. "Oh," I said as I showed him my hand, "I really think I need a medic." He seemed confused and then offered to carry my bike for me. I told him not to worry about it, I would walk it over. I had to walk across the center of the course. Right now my finger started to hurt a little bit. My thought at this point was that I wished I hadn't given my camera to my nephew to take pictures round the course because this would be one cool shot for the blog! Finally I made it to the stage area which was right across from the medic tent. I asked the officials there if they could get me a medic. They pointed across the street and said, "The medic tent is over there." At this point the pain was starting to get worse and each time I looked at my finger I didn't feel so good. "I really would like for you to bring me a medic over here. I think I broke my finger. I want to sit down." They looked at me with non-comprehending eyes until I held up my finger for them to see. At that point, Rich Hincapie looked over and said, "Get a medic over here now." In no time, someone from the St. Francis tent was over checking me out. She cleaned up the blood and started poking at my hand. "I think you just dislocated it," she said. I was so relieved I felt like laughing. She pulled on the finger and it went back into place and the pain was gone immediately. That was the end of my criterium race. A rookie mistake took me out. Today I'm paying for it. My left pinkie was dislocated and is black and blue today. All my other fingers except my right pinkie and both index fingers are jammed. The road rash on my left leg now matches the rash on my right. It has taken me nearly 45 minutes to peck this out! I woke up all ready to go for today's Cat 5 35+ criterium race. I went through my normal routine. I ate my McDonald's steak and egg bagel - actually, it might have been an omen. I was supposed to get a steak and egg bagel, but they gave me bacon instead. The kids climbed in the truck with me and we headed downtown. The beautiful red head couldn't go because of a prior commitment. We had no trouble finding a parking place at 8:30 AM. I signed in and then went to get my trainer and stuff. After setting up I started warming up while watching the Cat 5 34- racers make their laps. One rider tried to break away right off the bat. He stayed out there longer than I thought he would, but he was doomed. My pump didn't work. So, with about 10 minutes to go I went over to a tent where I saw a pump. I asked a guy if I could use his pump, and he made some smart remark about me doing it myself. I guess he thought I had asked him to pump it up. Then he told me, "Just let you know, you have to wear a helmet when you ride." I looked at him with a quizzical look on my face. Of course I was going to wear a helmet. He wouldn't let it go. He went off telling me how he had ridden for 20 years in Greenville and how he was "the Hincapie before George Hincapie came to Greenville." I told him that I was a responsible rider and I had not ridden my bike this morning without my helmet. He wanted to argue. I said, "Hey, man, thanks for the positive thoughts just before I go race." I don't care who he is. He was acting like a jerk. He was an official who seemed to be on a power trip. Turns out he is a somebody here in Greenville, but I hope visitors from out of town didn't have him as an example of cycling in our area! -- got to go, I'll finish this later. If you see me today and I have a silly grin on my face, I don't care. It is a residue of my ride last night. My new Tarmac Pro put it there. It was the supposed last Thursday night ride. I'm going to stop calling it that because we keep figuring out ways to get another one in. At this rate, we'll ride all the way through winter! Right now, I wouldn't mind, but come January I'm sure I would have other thoughts! There were four of us, Art, Mike, Webb, and myself. We did the typical Thursday night route. It was anything but typical to me. I had been waiting several days to finally get a chance to put my new bike through the paces. The ride was soooo smooth. I had the guys use ceramic bearings in the bottom bracket and replaced my old Speedplay pedals with a set of Speedplay X2s. Finally, the old ticking sound that I had been hearing for months disappeared! Turns out it was the pedals - mystery solved. I relished each rise. It was a chance to feel the difference in the weight of the bike. I felt like I was dancing as I rose from the saddle to accelerate up the inclines. The Tarmac responded immediately. The crank moved so well with the bearings that even when I stopped exerting pressure on my pedals, they kept moving pulling my legs along with them. I'm telling you, I was giddy! Then we came to Paris Mountain. Art pulled up beside me and said, "Now remember, you aren't supposed to push it tonight. You have a race on Saturday. Mike and I will be pushing it though." For the first time of the night I shifted to the smaller front ring. We turned up Altamont. I decided I was going to take it easy - but not too easy. I set a goal to keep my HR below 175. Typically on a climb of Altamont, I will exceed an average of 180 and will max in the high 180s. My max heart rate is 196 bpm and there have been times I'll exceed 190 as I climb "The Wall". Using my heart rate as my speedometer, I started the climb. Sure enough, Art and Mike took off. Webb and I started the climb together. At the first sustained incline I moved the chain to the largest big rear ring. So far so good. I was maintaining a 9 mph speed without even trying. The Tarmac Pro is certainly a climber! I was pulling over a pound less weight up the mountain - not to mention that I have lost about two pounds myself over the last week. We reached the top and it took me 14' 33" seconds. Art made the climb in 13' 03"! Mike also broke the 14' barrier. Man! Had I just hooked onto Art's wheel and followed him up, I could have had a new Paris Mountain personal best! Still, it was wise to take it easy. After this weekend, all limitations are off. I wondered what things would be like coming down the mountain. Would the bike show itself to be stiff enough to make handling a downhill as fun as climbing? Well, first I should point out that my maximum speed as 49.5 mph. That was without pedaling during the point where I typically push to get my max speed. Had I tried, no doubt I would have exceeded 50 mph. But more important than that, the bike almost moves before you have a chance to think about where you want it to go. The responsiveness is not just in the pedal strokes. Carving the downside of the mountain was awesome. It really was as though the bike was an extension of myself. I know you probably think I am overselling it. How could a bike be so different from another one? It just is. 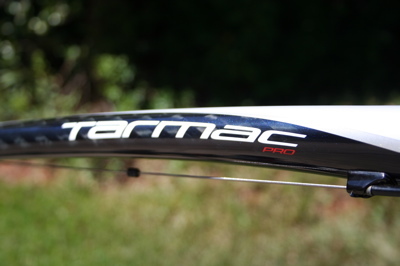 The thing about the Tarmac Pro is that you don't think about it. You almost don't notice it is there. You just go. Yesterday I took the Tarmac into Sunshine Cycle Shop to have the gears checked out. It had been making a racket and I seemed to imagine some resistance in my pedal stroke. Not sure what was real and what was my imagination, but whatever the case the guys were able to get it resolved. Today I hope to be able to ride. Yesterday was just so busy, I never got a chance to swing my let over the top tube. I did take some pictures of it when I brought it home. Last night was a disappointment. Earlier I mentioned how my bike was having problems. A long term issue was a good sized dent in my aluminum frame. Of more immediate concern was a racket that my chain and crank were making. Not only did it seem to annoy me with what sounds like a chain being dragged across the something, it also seemed to add resistance to my stroke. 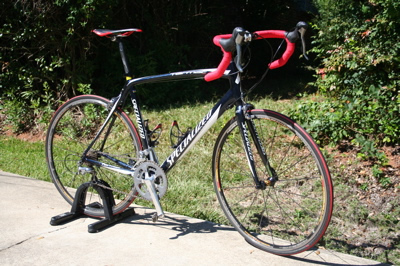 I thought I would take care of this by moving my components from my Allez to a Tarmac Pro frame. Sunshine Cycle Shop was giving me a great deal on the frame and not only would that take care of my frame problem, it would also give me a lighter bike, and I assumed that when the components were moved over the crank problems would as well. It is a beautiful bike (except I should have used red bar tape instead of blue) and it weighs in over a pound lighter than my Allez. It was like Christmas waiting to go pick it up! Finally it was in my hands and I planned to shake it down on a short ride. I had not gone 100 yards before I hit an incline and the racket was there just like before. Then it started to rain. My ride just fell apart at that point. I just came home. Things will get better. I know the bike is going to be a great ride. I've just got to figure out what is causing these issues. It is obviously not the frame because the same thing happens on two different frames. Oh, and the lever for the front dérailleur is really in a bind. I'm almost afraid I'm going to break it when I try to move to the larger ring. I'm just going to stop worrying about it and let the shop guys find the solution. In the past, I've always put a number up in the title when something good has happened. This time it isn't a good thing. 7:15 - as in 7:15 PM - is the time that I had to get off the road because it was getting too dark. I was told that Tuesday evening would be the last evening at Donaldson Center. I haven't heard that anywhere else. You could probably get in three laps or so. Remember, the time change is later this fall. Tonight was a bitter sweet night. I can't really talk about it right now as I'm keeping it under wraps. Right now it centers around 19. Tomorrow night that number will change - I hope significantly smaller. As for the ride, there were a number of cyclists out there at Cleveland Park. I didn't try to do anything too fast. I connected with Randy again and we did two laps together. He eased off to save himself for Donaldson Center. I was wanting to get in some miles, but by 7:15 I had to pull off after 20 miles. Tomorrow night I have to stay near the house so I can watch the kids. Ever baby sat while sitting on your bike? I do it. I do a loop that takes me by my house every two minutes. Thing One can stop me if they need me. Tomorrow could be an interesting day! Where did Gordon come from? I had a funny feeling that the Talladega race was going to be kind of a sleeper for the first half. I didn't get around to seeing the race until the drivers passed the halfway point. It almost appeared to be the same line up as the start of the race. It was odd to see Gordon, Johnson, and Mears back toward the very back. Not having seen the first half, my initial concern was that they had gotten caught up in an accident. The more I watched at that point, the more I realized they must have made the decision to go to rear and wait for the end of the race. I made the decision not to. It was beautiful day. So, I hoped on my bike to do a home, over Piney, over Paris and back ride. I figured I would get back in time to see some of the laps before heading over to my church for the evening service. The ride was okay, though I started having something major happen to my bike. It was as though the front dérailleur was dragging on the chain. There was something making a racket and my crank didn't seem to be turning smoothly. Anyway, I made it back just to find that Gordon and Johnson were still in the same place. After a shower we loaded up the family and headed to church. On the way, I tuned into the race. Gordon got penalized and had a pass through penalty. I thought he might as well hang it up. Then there was a caution immediately and Gordon got the "lucky dog". When I went into the service, he was in last place on the track. When I came out, Gordon was the winner! I was glad I recorded it. I got home and brought up the recording. NO! I had accidentally recorded the Weather Channel! I had to settle for watching the replays on SPEED. This means that I have a four race lead now on BBuck. Super_D beat him today! I won against A_Junior_Fan. It is going to be pretty tough for BBuck to get past me, but I'm not going to count my chickens before they hatch! The point of this post is to comment on my Tar Heels. I haven't mentioned them that much this season. At 1 and 4 going into this weekend, there just wasn't much to write about. Today, they played a pretty good game. If they keep improving, ol' Butch could really turn this program around. It will be fun to see what happens next weekend when the other Carolina comes to Chapel Hill. No, we are not fairies! Mike, Art, and I just can’t let go of the Thursday night ride. We wheeled out just after six and managed to squeeze out our normal ride. The cloud cover made the last few minutes even darker than it would have been. Yesterday I was pretty sore from my crash on Tuesday evening. They always say the second day is worse than the first. I had limped around all day, but when I got on my bike the soreness disappeared after just a few moments. By the time I returned home I was feeling great – except for where my glove had rubbed the scab off of the wound on my palm. I could never find a comfortable place to put my hand on my bars. Then the sweat got in there and, ooooo, that stings! Riding along the base of and over Paris Mountain was really cool. There was a bank of fog about halfway up. As we rode along the base we could look up and see the cloud up where we would soon be riding. Once we got there we seemed to be enveloped in the fog and it shut out everything around us. Our safety lights bobbed up and down blinking on and off in the mist. Some kid might have looked up the road and thought there were woodland fairies making their way to the peak. I didn’t have my mind set on beating my record last night. It was just a recovery ride from my crash. However, as we neared the wall, Art said to me, “We’re at 12’ 07”. If you sprint you might beat your record.” I couldn’t help it. I stepped it up and went for it. Because I had not pushed myself too much at the start, I was feeling pretty good. I started off out of the seat about three rings down. I maintained that push until I made that final left turn toward the KOM line. I went down to the easiest gear and sat. My heart rate hit 190 at that moment. I kept up a high cadence and crossed the line. I looked down and thought I saw 12’ 43” – “No way!” I thought. In the low light, I just couldn’t make it out. Was that a 13 or a 12? I knew I had climbed that section better than ever before, but could I have done it in around 30 seconds? My mind wasn’t clear enough to process the mathematics. Turns out it was 13’ 43” and that’s okay. At the halfway point, we were at 7’ 04” which means I had a better second half than first. I really think that 13’ is doable for me. It will get tougher as the weather gets cooler, but perhaps by spring I’ll be ready. You can read about my wipe out at the GreenvilleOnline.com cycling blog. One thing I didn't mention in that entry that is kind of cute is the fact that while riding the "Batesview Criterium" I had my own cheering section. Right near the top of the 11% grade climb, there is a home with several kids. About three laps in, they were all in their front yard waiting for me to come by. As I would pass, they would cheer me on... "Go, go, go!" They would yell and a couple of them got out their bikes to ride along with me once I reached the top. It was actually kind of neat. Here were some kids who understand cycling! My guess is it is because their dad is also a cyclist who earlier this year rode across South Carolina in five days with one good leg and a prosthesis. I'll post about exactly what hurt tomorrow. Right now, I don't feel much like writing. 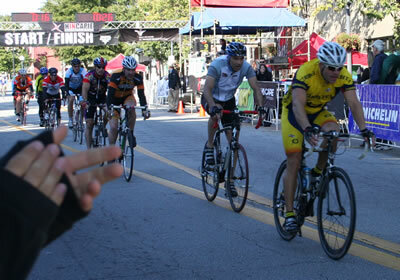 However, you can see my entry on the GreenvilleOnline.com cycling blog that I put up today. Actually, I should say the drivers of my fantasy league survived. Last night's race in Kansas was better than I expected. It took a long time to get it done due to a rain delay, but when the racing was on, it was good. Jeff Gordon got caught in about 20th place when the officials shortened the race by about 10 laps. He really poured it on and finished with a top five. Had they gone the distance, I think he would have done even better. Kyle Busch got spun out by next year's driver for the the 5 (will be 88) car. They replaced the whole front hood - even had Tony the Tiger on it. He hung with the field and managed to come home 41. Denny Hamlin had several issues on the track. Finally he was taken up in an accident that I thought would put him out of the race. He came back to finish two laps down in 29th. Thankfully, Hamlin's accident was caused by Jamie McMurray. He finished one lap down in 24th. DraftingWithYates other drivers also had trouble. Matt Kenseth got caught in "the big one" and having lead 49 laps, finished 35th. Jeff Burton also had his hood shoved up followed Kenseth on the finishing list in 36th. My win over DraftingWithYates allowed me to stay ahead of BBuck who was racing against the give me team. I hate to say it, but I was so glad to see Tony Stewart spin out. He was a danger out there with that tire rub. I'm sure he'll whine and complain that Kurt Busch "ran all over him." But the way I see it, the tire rub put him in that position and a slower car trying to run with fast ones will end up getting run over. Anyway, next week will be very interesting. The Car of Tomorrow at Talladega. It is going to be scary for me. I go up against A_Junior_Fan: Dale Earnhardt, Jimmie Johnson, and Martin Truex. BBuck goes up against Super_D. I'd like to see Super_D take him, but the chances are that I will drop one to BBuck next week.